Some science teachers use science notebooks. That's cool. My students use notebooks in our science learning, and I feel that there is such value in pencil to paper that should be recognized. Much of my personal science and education brainstorming and note taking occurs within a paper notebook. I also love using sketch notes with my iPad. So, a blend is considered appropriate in my mind. I also know that each student thrives with different methods presented to them. So, in my 8th grade class, I try to give students multiple ways to record and share ideas. One method that I feel is powerful and helps support science literacy is blogging. 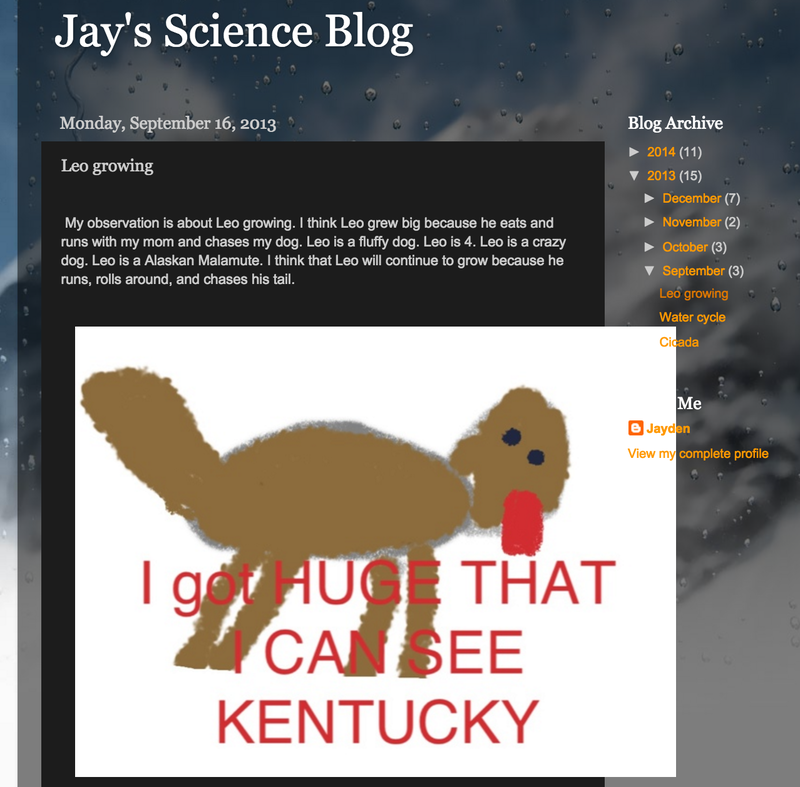 Each of my 120+ students have their own science blog. They used their school google accounts and www.blogspot.com to design a blog. We used the Blogger app on the iPad for creating our posts. I piloted this method when I taught fifth grade a couple years ago. Since those beginning blogs, I've tested a couple of different apps that have more options. We always seem to come back to Blogger. It's easy to use with a short learning curve, but it is somewhat limited. Students can only add text and images within the app. They are able to get more detailed in a browser based mode. This is one of my favorite posts by Jay. She even had a comment by Mr. TJ Houston! I know that not every student works perfectly in the blogging environment. Some students will look at this as another writing assignment, but I hope to use the blog process to mix up the way we share science. Many times my students create Keynote presentation and share their learning orally to the whole class. Sometimes, we do a quick think, pair, and share. We also build books, create movies, and conduct demonstrations. I think blogging adds an alternative to these methods for sharing science thinking and work. We are sharing with a larger audience. In our use of blogging, we build up to more developed blog posts over time. First and second quarter posts are somewhat structured and guided through teacher prompts and guiding questions. These posts are designed to direct students to reflect upon the science topic, event, or project. Also, some posts are strictly for sharing a short cycle project, like a word cloud or sketch done in relation to the science. By the third quarter, students are given less prompts and structure. We take small steps to get comfortable. Prompt given: What does science look like to you? Prompt given: Share the Marshmallow Challenge. Tell the purpose of the challenge, how you tackled the challenge, and your results. 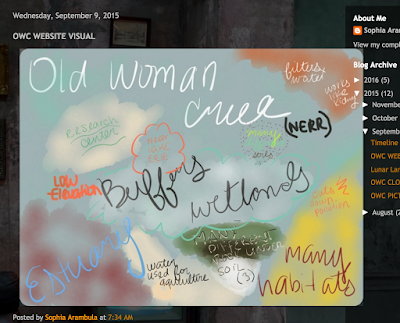 Prompt given: After reviewing the Old Woman Creek website, create a sketch note of some of the important science vocabulary and ideas. Prompt given: Share how you anticipate your seismic safe building will perform during the shake table tests. Be sure to explain the "why" in your answer. 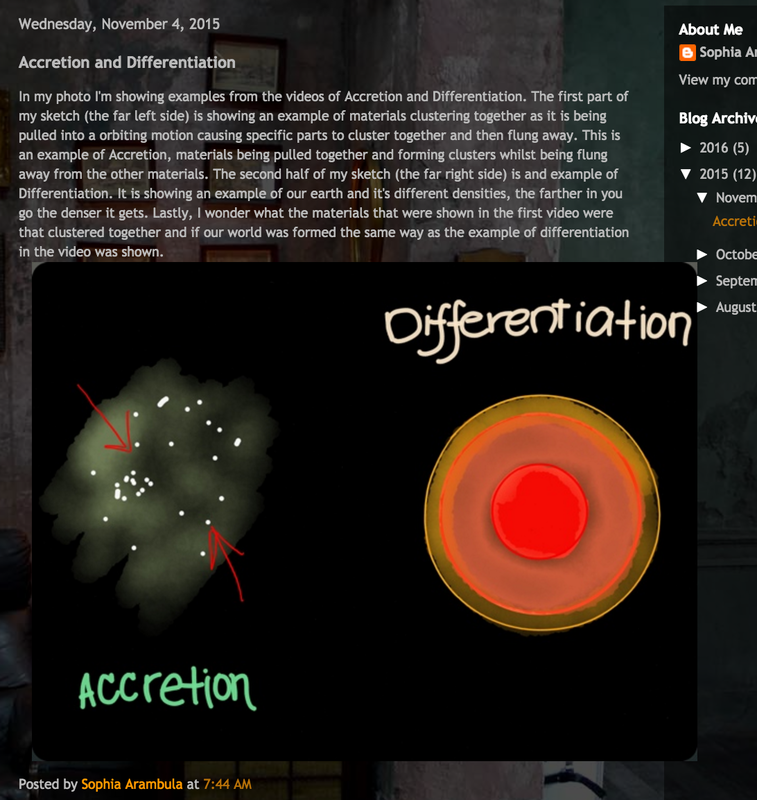 Prompt given: As your are watching the video about planet formation (for the second time), create a sketch and blog post of what the terms 'accretion' and 'differentiation' mean. Share an 'I Wonder' statement in your post. Prompt given: Share your teams investigation. Be sure to begin with what you were exploring, how you designed your test, what variable were controlled and which was manipulated, how data was collected, your results, how the results could have been skewed or impacted by outside factors, your conclusions, and how your could extend the investigation. 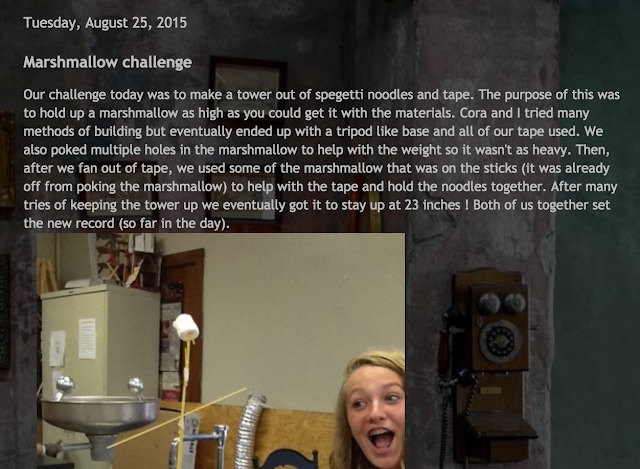 Students were given a check list for this investigation share! As we continue into the second and third quarter, students will be given less of a checklist within the rubric for the blog posts. "I really love the pictures with the information. I also like how you organized your information. " "I love how your picture looks real and how you showed the distance they were dropping the eggs. You also showed what they were doing and told everyone what they were doing too. you describe the materials and everything else very well." "That's a really good picture Sophia. I really like ow the colors pop and how the picture explains accretion and differentiation. I think for both, but mostly the differentiation you could've labeled a few things. I can relate to this because when I cook I can see the differentiation between the oils and water." 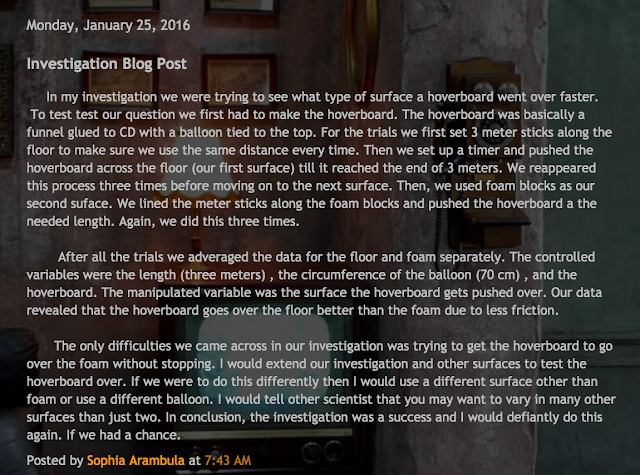 "I found this post very enjoyable to read Sophia! I loved how you included how you had fun during the experiment. Especially since I was on your group! You made it very fun. I feel that you could improve on your explanations of what we did and how we did them. I can relate to this because I loved the first quarter also and had so much fun with you on the trip to OWC!" "I really like your investigation, and how you dealt, and solved the problems you guys came across when you tried to test it. 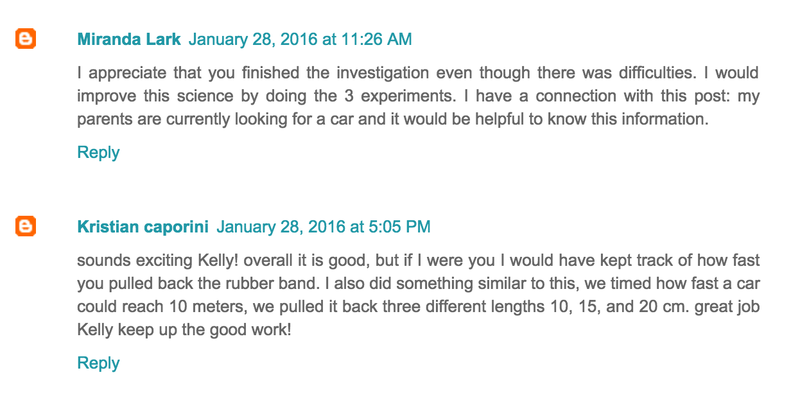 I also think that your extension on your investigation is a good idea, since you only used a small ramp for your first time, this way you could get more results, and you'll have more insight on how the RC car is affected." Not every post is graded. With 120+ students, I don't have the time for that. Many times I will rotate the classes for my review of the blogs. This is a window into my students' thinking for me. Some posts give me indicators of understanding AND misunderstanding. The conversations that develop from reading the blog posts are powerful! We use blogging when blogging makes sense. Just like every other strategy, over use can become counter productive. Science conversation is important! The more we can encourage dialogue about questions, learned information, and investigations, the more comfortable students will become in this mode. Hopefully, the process of writing about science in a blogging format can help strengthen student interest, commitment to question, and participate in the science around them. I'm sure I could keep going on and sharing more of my students' blogs. I think they do a nice job sharing their science understanding, and I'm proud of them! 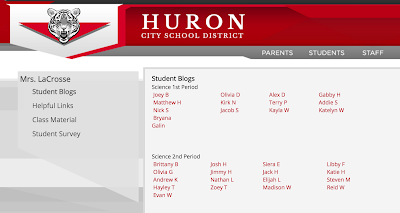 I'm hoping this gives some insight into why I choose to use blogging in the science room. If you have some ideas, comments, or questions, please share!